UNION, Ky. - Most of us have enjoyed at some point the experience of rolling large snowballs and packing them together to make a primitive resemblance of a person. After a few pieces of coal and a carrot, you have your snowman. Making a snow gator, however, is a new talent altogether. 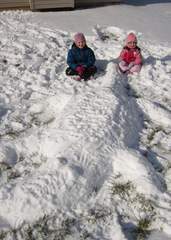 Meghan Jones, 8, and her sister Ayla, 4, decided to make the best of last week's snowfall by creating a 10-foot gator in their front yard. The girls' mother, April Jones, explains that the idea was inspired by the University of Florida's mascot. "They decided to make their daddy's favorite animal," Jones says. "That's where he went to school." April and her family are originally from Louisiana and Florida, so they've had plenty experience with reptiles up-close. The snow, however, is somewhat new. "Being from the South, our snowman skills aren't the greatest," Jones admitted. "But we sure know what an alligator looks like." The large lizard was made in about 15 minutes. The Joneses have lived in Kentucky for six years, but the last snowfall was only the second true snowfall they've been able to enjoy. So, are there plans for more creative works with the next time it snows? "The girls have said they've always wondered why there are so many snowmen, but no snow-women," Jones said. "Maybe they'll go with that next time." Unfortunately, as of this writing, it looks like much of western Kentucky might in the throes of a major ice storm. No snow 'gators from this one. It's not Western Kentucky. Those people in western Kentucky are FUCKED up. Could they do a salty next time it will take a lot longer but worth it, refreshing post.